Exquisite, modern one and a half story home. Stunning two story entrance with open staircase leading up to a balcony overlooking the great room. Archways and accentuating white columns top off the spacious formal dining area. Beautiful hickory hardwood floors adorn most of the home. Gourmet kitchen boasts custom built maple cabinetry built by Bob Schumer, granite counters, an island, breakfast bar, and built-in hutch. Bells and whistles include easy close and pull out drawers, walk in pantry, double oven, and cooktop. Breakfast nook offers a view of the back yard and leads to the patio. The hearth room keeps the family close with the fireplace and takes you to a screened in porch where you can spend evenings recounting the day’s events. French doors draw you through to the great room with 18’ ceilings, a wall of windows, built in bookshelves and wood burning fireplace. Main level master suite has a beautiful view and plenty of natural light flowing from the floor to ceiling wall of windows, his and her closets, double sink, tiled walk in shower and private stool. Second level features 3 bedrooms 2 full baths, and a den. 2 of the upper bedrooms have double closets and a Jack and Jill bathroom each with their own vanities. The third bedroom suite has a walk in closet. Downstairs, another bedroom could be utilized as an office. The family room is adjacent to a full bath and game area that walks out to a patio. An abundance of storage space with double doors makes lawn storage convenient. Main level laundry is equipped with sink, cabinets, and built in bench. Additional features worth noting include a dual geothermal system which also heats the water, water purifier and softener, two interior garage entrances, interior and exterior audio speakers, outlets strategically placed above kitchen cabinets and mantles. Exterior soffit lighting nicely highlights quality landscaping that encompasses the home. 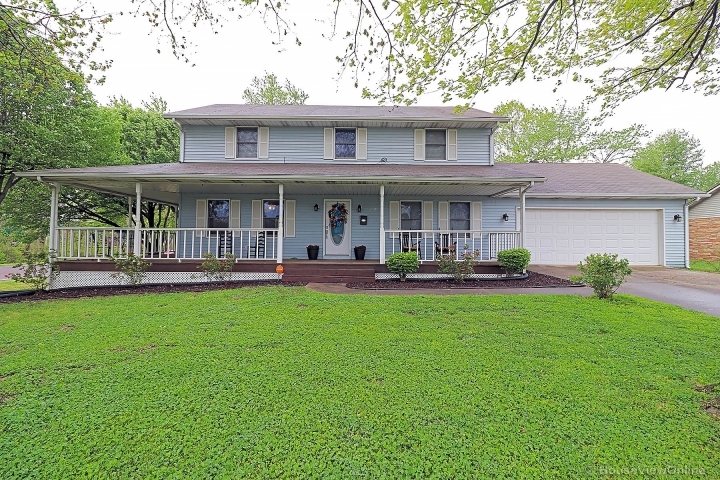 Nestled on 5.17 acres, partially wooded, is tranquility and privacy at the end of a cul de sac in an established subdivision right outside the city limits of Perryville.